On the odd occasion I hit what’s called the ‘writer’s wall’, I can’t jump over it, I can’t go under it. So I head over to Google where Mr Cutt’s and friends help me run through it (I hope Panda 4.2 likes today’s article). On more than one instance, Abu Dhabi has given me the inspiration required to create an article for you guys to enjoy. Today is no exception. The UAE is recognised as a ground breaking destination for world firsts. With the world’s fastest roller coaster, the Formula Rossa, part of the neighbouring Ferrari World experience, ROGO’S offers a spectacular culinary experience for fun-loving diners looking for a new and exciting dining adventure. Located in one of the many luxury shopping malls in Abu Dhabi, ROGO’s have created a trend that will take the dining experience to a whole new level (literally). 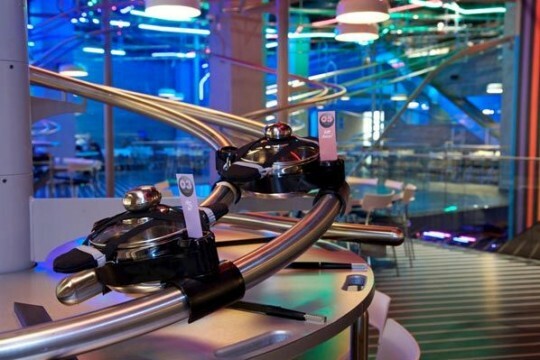 A fleet of 30 individual rollercoaster tracks deliver food, drinks and tabs straight to the customer’s table without any human contact. · Sealed containers travel along a network of double loops, spirals and turns that is spread out through the 14,000-square foot restaurant at Yas Mall, on the man-made Yas Island. · Customers place their orders on tablet computers and then sit back and wait for their meals, which are served in pots, to race along the track. · The highlight of the 360-seat restaurant is a gargantuan tornado-shaped spiral that gets narrower from top to bottom. 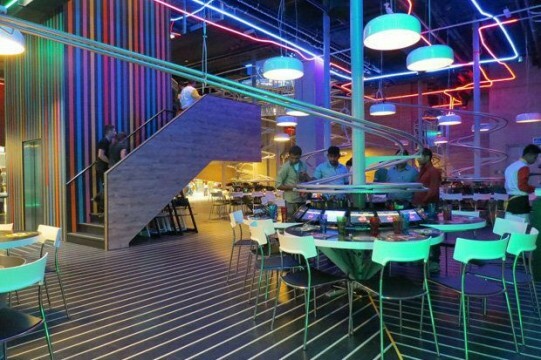 This must path the way for the robot restaurants surely, oh wait… That has been done already.